By the time you read this printed newsletter the August 17, 2016 shareholder vote on the merger will be complete, but as I write this, it has not yet occurred. For that reason there may be added details available as you read this. The company must be confident in the outcome of that vote, since the projected merger date has been moved up to September 2. The spin-off of automotive seating (Adient) is still projected for the end of October. Keep on top of this, especially if you are also a shareholder with enough invested to have a significant effect on your financial future. The 500+ page proxy statement/prospectus and related information sent to all stockholders, is more than can be summarized on this one page. I personally do not believe there is a person alive that has all the answers on this subject. However, it has generated more discussion among our fellow JCI retirees than all other topics combined. That was evident at our July luncheon. We (WSJ Society) are trying to include links to relevant documents about this topic on the retirees website “wsjsociety.com”. Since this is the hottest news for us right now, look on the page titled “Front Page” (not the Home page) on that website. 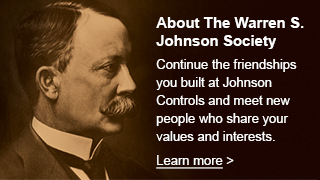 Also, the Johnson Controls website “ johnsoncontrols.com” and their “Investors Relations” page is where they provide the most information for shareholders. You can also try general searches on the Internet which will find articles published on business news websites and investment advisory services. As always, keep in mind any biases each author may have as they write about this merger. If you are not computer or internet savvy, ask you grandkids for help. They can get you pointed in the right directions. If you choose to guide the conversations wisely, you may want to open the door for family financial discussions with those next generations, which may have been part of your plans for this investment, but you just hadn’t gotten around to it. This could be that “Round Tuit” you were waiting (or procrastinating) for. Even if not for the next generation, it might be the time to diversify your holdings across other investments. TALK to whomever you work with on taxes – NOW !! If cash is needed to cover the tax bill, or diversify is in your plan, a pre-merger mid-$40’s may look better than the forced $34.88/share that’s part of the merger. I’m no tax or investment expert, nor do we have any inside information, but I’ll point you to what we’ve heard. We hope to see you at the September 24, biennial reunion.